We also offer a free registration plan if immediate access to the catalog is unnecessary for you and you have 3D models for exchange. Using a free plan you can download models only if you uploading yours and your models are accepted in the catalog after our review (2-4 weeks after uploading). You'll be able to download one model per each download of your uploaded model by other site user. Click here to register the free plan. If you need to download models immediately and without uploading, please order one of the registration plans above. RC CAD is an acronym for "Radio Control - Computer Aided Design". 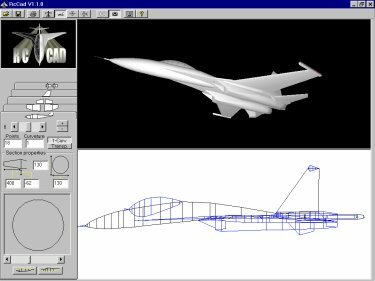 This software is specially designed to help modelers to create airplanes. It supplies a real-time 3D visualization of the model you are designing. Just click and re-shape wings, fuselage, ... RcCad handles 3D data processing easily. When you change the features of your plane, the 3D view is immediately updated. The visualization is also interactive, so that you can rotate, zoom-in, etc.. in real time. The commercial version is sold at a competitive price in order to offer CAD to the greatest number of modelers. sphere for 150 and a torus for $1000? even I can get into business! hahaha! function hasn't change much until I saw the above tutorial. I wonder what version of max that is? im drooling!!!!! is it possible to download just that vrml exporter for max 6?